Perhaps surprisingly given that most of my previous encounters with ancient manuscripts have been dry and academic this is an engaging, humorous, and enlightening romp through white-gloved rare book rooms throughout the world where we're brought as face-to-face with these dusty old folios as most of us will ever get. A San Francisco Chronicle Holiday Book Gift Guide Pick! 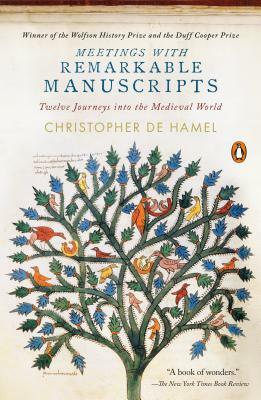 Christopher de Hamel is perhaps the best-known writer on medieval manuscripts in the world. In the course of a long career at Sotheby's he catalogued more illuminated manuscripts than any other person alive, and very possibly more than any one individual has ever done. Christopher de Hamel is a Fellow of Corpus Christi College, Cambridge; he was until recently librarian of Parker Library in Cambridge, a collection which includes many, even most, of the earliest manuscripts in English language and history. De Hamel lives in London and Cambridge.